Are couch potatoes really brain dead? You’ve probably already read articles connecting prolonged sitting with obesity, cardiovascular disease, and cancer. But how about brain performance? This week, a UCLA study was published that found sedentary behavior a significant predictor of thinning of the medial temporal lobe (MTL), which is the part of the brain responsible for storing and accessing memories. For a visual, see the picture of the “memory walls” featured in the Pixar movie Inside Out. Imagine these walls thinning over time as a person increases their sedentary behavior! The memory walls of your brain, as depicted by the Pixar movie Inside Out. A recent study links prolonged sitting with the thinning of your brain’s medial temporal lobe, where your brain stores and accesses memories. The study included 35 middle-aged and older adults who did not suffer from dementia (25 women, 10 men; 45–75 years). Participants completed MRI scans of their brains as well as the International Physical Activity Questionnaire to measure physical activity, including the average number of hours spent sitting per day. The researchers found that the thickness of the Medial Temporal Lobe (MTL) decreased as the average sitting time increased among participants. For the first time, it’s been proven that prolonged sitting and brain health are directly correlated; as expected, it’s an inverse relationship. In an interview with Medscape Medical News, the study’s lead author Prabha Siddarth says, “The finding that sitting reduces the thickness of these important structures is relevant because it suggests that reducing sedentary behavior may be a possible target for interventions designed to improve brain health in middle-aged and older adults.” Furthermore, the study found that physical activity, even at high levels, does not offset the harm of prolonged sitting. This means that an employee who sits for 8 hours a day at work and goes to the gym for 1 hour per day is still at risk to suffer from long-term memory loss due to their sitting habits. Protecting your brain’s health is yet another reason to reduce your sitting time and incorporate daily physical activity into your life. But in a busy work day, how can we take steps to cut down on our sitting time? Walking breaks are one option, as well as gym sessions during lunch. But to really cut down on your sitting time, you need a way of working that brings physical activity to your desk. 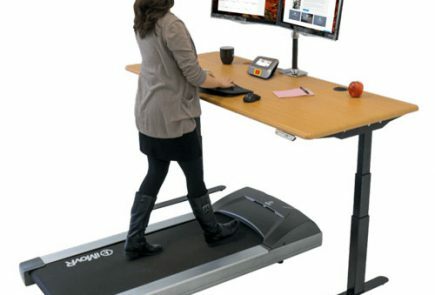 That’s the reason behind the growing popularity of standing desks, and the more effective (and revolutionary) idea of treadmill desks. For information about the health benefits of standing desks and treadmill desks, see our helpful compilation of scientific articles on the subject. We’ll add this study to the growing list. This study was led by Prabha Siddarth, a biostatistician at the Semel Institute for Neuroscience and Human Behavior at the University of California Los Angeles (UCLA).